If the goal is higher living standards, then higher levels of productivity are necessary. And that requires entrepreneurship and innovation. But bad tax policy can be an obstacle to the economic choices that create a better future. I’ve already shared lots of research showing how punitive tax rates undermine growth, but it never hurts to add to the collection. Let’s look at a new study by Ufuk Akcigit, John Grigsby, Tom Nicholas, and Stefanie Stantcheva. Here’s the issue they investigated. …do taxes affect innovation? If innovation is the result of intentional effort and taxes reduce the expected net return from it, the answer to this question should be yes. Yet, when we think of path-breaking superstar inventors from history …we often imagine hard-working and driven scientists, who ignore financial incentives and merely seek intellectual achievement. More generally, if taxes affect the amount of innovation, do they also affect the quality of the innovations produced? Do they affect where inventors decide to locate and what firms they work for? …In this paper, we…provide new evidence on the effects of taxation on innovation. Our goal is to systematically analyze the effects of both personal and corporate income taxation on inventors as well as on firms that do R&D over the 20th century. To perform their analysis, the economists gathered some very interesting data on the evolution of tax policy at the state level. Such as when personal income taxes were adopted. By the way, I may have discovered an error. They show Connecticut’s income tax being imposed in 1969, but my understanding is that the tax was first levied less than 30 years ago. 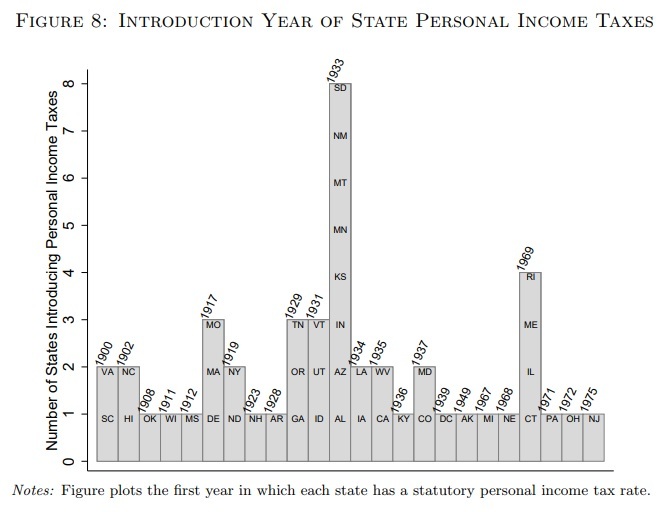 In any event, the authors also show how, over time, states have taxed upper-income households. They look at 20th-century data. If you want more up-to-date numbers, you can click here. But let’s not digress. Here are some of the findings from the study. We use OLS to study the baseline relationship between taxes and innovation, exploiting within-state tax changes over time, our instrumental variable approach and the border county design. On the personal income tax side, we consider average and marginal tax rates, both for the median income level and for top earners. Our corporate tax measure is the top corporate tax rate. We find that personal and corporate income taxes have significant effects at the state level on patents, citations (which are a well-established marker of the quality of patents), inventors and “superstar” inventors in the state, and the share of patents produced by firms as opposed to individuals. The implied elasticities of patents, inventors, and citations at the macro level are between 2 and 3.4 for personal income taxes and between 2.5 and 3.5 for the corporate tax. We show that these effects cannot be fully accounted for by inventors moving across state lines and therefore do not merely reflect “zero-sum” business-stealing of one state from other states. Here are further details about the statewide impact of tax policy. A one percentage point increase in either the median or top marginal tax rate is associated with approximately a 4% decline in patents, citations, and inventors, and a close to 5% decline in the number of superstar inventors in the state. The effects of average personal tax rates are even larger. A one percentage increase in the average tax rate at the 90th income percentile is associated with a roughly 6% decline in patents, citations, and inventors and an 8% decline in superstar inventors. For the average tax rate at the median income level, the effects are closer to 10% for patents, citations, and inventors, and 15% for superstar inventors. At the risk of understatement, that’s clear evidence that class-warfare policy has a negative effect. The study also looked at several case studies of how states performed after significant tax changes. …case studies provide particularly clear visual evidence of a strong negative relationship between taxes and innovation. 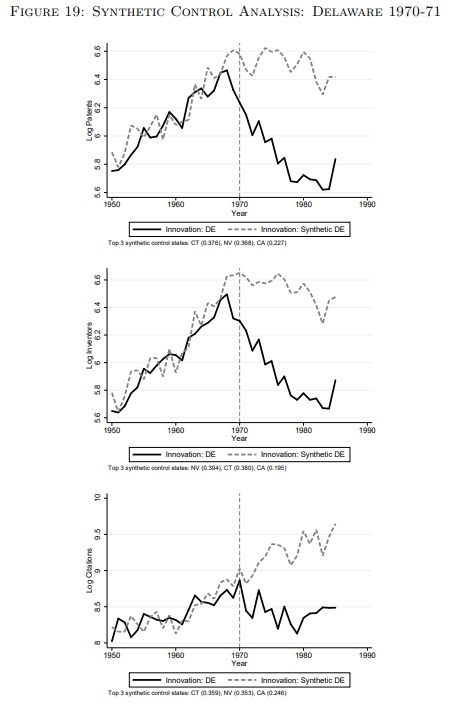 When combined with the macro state-level regressions, the instrumental variable approach and the border county analysis, the results overall bolster the conclusion that taxes were significantly negatively related to innovation outcomes at the state level. Here’s the example of Delaware. For what it’s worth, we have powerful 21st-century examples of the consequences of bad tax policy. Just think New Jersey, California, and Illinois. Back to the study, were we find that the authors also look at how tax policy affects the decisions of people and companies. We then turn to the micro-level, i.e., individual firms and inventors. …we find that taxes have significant negative effects on the quantity and quality (as measured by citations) of patents produced by inventors, including on the likelihood of producing a highly successful patent (which gathers many citations). At the individual inventor level, the elasticity of patents to the personal income tax is 0.6-0.7, and the elasticity of citations is 0.8-0.9. …we show that individual inventors are negatively affected by the corporate tax rate, but much less so than by personal income taxes. 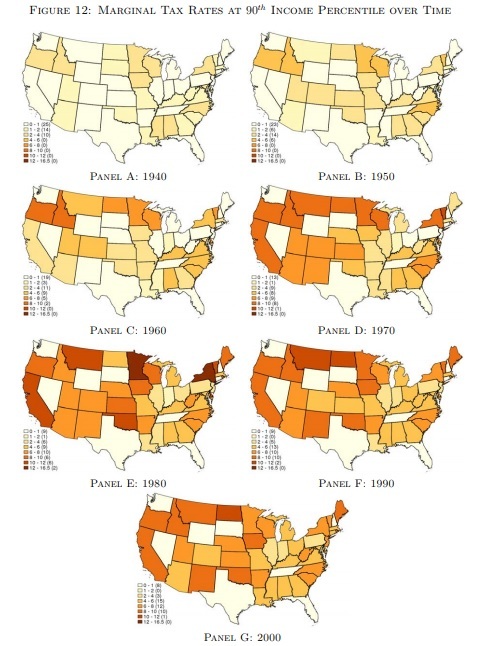 …We find that inventors are significantly less likely to locate in states with higher taxes. The elasticity to the net-of-tax rate of the number of inventors residing in a state is 0.11 for inventors who are from that state and 1.23 for inventors not from that state. Inventors who work for companies are particularly elastic to taxes. And here are additional details about the micro findings. …patenting is significantly negatively affected by personal income taxes. A one percentage point higher tax rate at the individual level decreases the likelihood of having a patent in the next 3 years by 0.63 percentage points. Similarly, the likelihood of having high quality patents with more than 10 citations decreases by 0.6 percentage points for every percentage point increase in the personal tax rate. …We find that a one percentage point increase in the personal tax rate leads to a 1.1 percent decline in the number of patents and a 1.4-1.7 percent decline in the number of citations, conditional on having any. …the likelihood of having a corporate patent also reacts very negatively to the personal tax rate… A one percentage point decrease in the corporate tax rate increases patents by 4% and citations by around 3.5%. The IV results are of similar magnitudes, but again even stronger. According to the IV specification, a one percentage point decrease in the corporate tax rate increases patents by 6% and citations by 5%. Here are some of the conclusions from the study. Taxation – in the form of both personal income taxes and corporate income taxes – matters for innovation along the intensive and extensive margins, and both at the micro and macro levels. Taxes affect the amount of innovation, the quality of innovation, and the location of inventive activity. The effects are economically large especially at the macro state-level, where cross-state spillovers and extensive margin location and entry decisions compound the micro, individual-level elasticities. …while our analysis focuses on the relationship between taxation and innovation, our data and approach have much broader implications. We find that taxes have important effects on intensive and extensive margin decisions, on the mobility of people and where inventors and firms choose to locate. In other words, the bottom line is that tax rates should be as low as possible to produce as much prosperity as possible. P.S. If you check the postscript of this column, you’ll see that there is also data showing how inventors respond to international tax policy. And there’s similar data for top-level entrepreneurs. on September 17, 2018 at 5:29 am Како влијаат даноците врз иновациите? The article misses the point on the types of taxes: capital gains on investment, capital gains on collectibles and real estate, corporate taxes, and income taxes. Capital gains on investment should immediately go to zero, this can be accomplished with a “Painless Tax”. The inequality crowd will squeal, but innovation and job creation will take off. Tax on collectibles should rise to income tax levels. This will move money into investments.